Of Horses and Men: Why Do We Have To Grow Up? When I was younger I had to beg and plead with my parents to ride a horse. It wasn't until I was 11 that I got that wish granted. Before that I would take any bit of horse that I could. We had a somewhat close neighbor that had horses for a short time and I remember sitting in the woods and waiting for a good breeze so that I could smell all the sweetness of horses. Horses were magical to me, something that I was drawn to and loved without ever being around them. I woukd dream and write stories about horses all day long. Everything in school had to do with horses and teachers even had to ask me to stop doing book reports on horses. During recess I would get a band of kids together and he would gallop on all fours and play wild horses. It wasn't until parents complained that their kids jeans were getting holes in the knees that the teachers made me stop. I even would have a game at my house where my friends and I would ride brooms and my little brother would be the fox and we would hunt him all through the woods jumping jumps andover rock walls just like I had seen in pictures. I eventually took my first lesson when I was 11 on a one eyed arabian mare that was hotter than hot. We spent lots of time learning the tack and proper horse care. I was fully prepared because my dad said that I may not even ride my first time because there was so much to learn. With eyes wide I asked my instructor if I was going to ride today. She just lauged and said ofcourse. The first time I put my leg in the stirrup and gathered the reins I felt like I was truly home. Sure I had been on pony rides and such before and had even ridden an elephant but this was different. All of the black stallion stories and everything that I knew about arabians flooded my mind. I had a lunge lesson and even did a little trotting trying to post like a fish flopping out of the water. Now let's face it, I have never had a natural ability for riding. It came harder for me than most naturals but I worked so hard at it that it was almost an obsession for me. After that first lesson I was beaming. After untacking Davah I asked my instructor if she thought that I wuld ever be a good rider. She looked at me sternly and said that I would never be a great rider but she could make it so I could stay on. That was all the encouragement that I needed, that statement lit a fire under me and it still burns brightly today. Many people think that that was a horrible thing to say and maybe to an 11yo it was but I was oblivious because all I could think about was to learn anything and everything that I could about horses. My parents weren't too keen about paying for lessons every week so I started working at the barn for lessons, carrying half full water buckets twice and cleaning stalls and letting horses in and out. As my riding progressed I started riding more and more horses. Big, small, drafts to arabs to TB's and lots of quarter horses and paints and an appy or two thrown into the mix. I started spending every weekend there and even had my own room in her house. Her business also started to grwo from the 2 horses she had when I first started to 10 and then 15. As I grew into a teenager and had become strong physically and mentally I started helping with horse camp and leading trail rides and watching the farm while she was away. My brain was like a sponge and I tried soaking up as much knowledge as I could. I started showing at local open shows and my parents even half-leased me a horse for 6 years. I think they saw the dedication and passion that I had for horses although they really iddn't approve of it. They were reluctant to come to horse shows and stopped watching my lessons and would just drop me off at the barn and have me call to be picked up. I have to sya that this hurrt my feelings some. I also played softball and other sports in school and they would never miss a game and were very supportive of that. Why couldn't they see my love for horses like that? The barn that I learned and rode at was exclusively dressage. Even though we rode trails and things everything was in a dressage saddle and jumping was really frowned upon. I looked forward to two things in the year. Kids Camps where we could dabble in jumping under no professional instruction and also the "Kimball Quarter Mile Run" that we had once a summer to see who the fastest horse was. I loved galloping and speed from early on. My friends and I would sneak off down the trails and have galloping races on the lesson horses. The horses thought it was a great break in the routine and us girls would roll up our stirrups like jockeys and be riding the edge of death most of the time. We made sure to fully cool out the horses and wipe down any sweat marks so no one could tell. As I've gotten older the owner must have known what we were doing because of all the galloping marls on the dirt roads but she never said anything except that we betetr not make her lesson horses hot. I look back on those days fondly. Those were some of the best times of my life. We rode in the rain, snow, heat and anything else. Nothing could keep us from our horses. I had a small group of friends that were just as horse crazy as myself at the time. Well As I got older and the barn owner remarried to a jerk things began to unravel there. Dust collected in "My" room as I was reluctant to stay there much, tension grew between her and me and I stopped riding there completaly. SHortly after the horse I had been leasing died due to circumstances that could have been prevented and I was heart broken. Still thinking of him today brings tears to my eyes, someday I'll poast about Jose and see if I can put a pic of him up here. He was one of the most important teachers in my horses career and we learned a lot from each other. I will always have a special place in my heart for him. 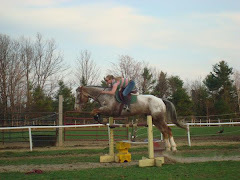 I then went to college where I learned the art of hunters and equitation. I fell in love with the riding but not all the politics and money that it took to be something. I got Possum, graduated and kept on riding. I am now at a great barn where I feel like a member of the family. People and horses of the entire rainbow and I love it. No politics, income doesn't matter and everyone is there for one reason, they love horses. I also enjoy the good amount of respect that I'm given due to my riding and knowledge of horses. I like to teach people who want to learn and share my knowledge and have some good debates, that's how we all learn and get better. But sometimes that spark fades that I used to have as a kid. Sometimes riding has become a chore instead of a magical priviledge that it used to be. Sometimes I just sit in the pasture with my hrose gazing at the sunset or go on a long trail ride pouring out the contents of my heart to him to bring me back to that place and feeling I felt so long ago now. I think every horse person should go back to those times once in a while. It's not about the blue ribbons, or the money spent or the breed of horse or the tack you own. It's all about the horses and their special bond with us. How they can tell what we're feeling. Allow us onto their backs and communicate with us and do as we ask. So as I'm sitting here in the office day dreaming about the way things used to be I have decided that I want every ride to be special. Every encounter with any horse to be special. I always say that horse people are a breed apart. It makes no liter sense why we do what we do for horses, blood sewat tears and lots of money. Why not enjoy what we sacrifice for and really take advantage of why we own or ride or even just be around horses. So what are some of your magical times with horses? How did you get involved with horses? My horse obsession also started at an early age. I rode sticks I found in the woods pretending it was my ranch horse, and I couldn't wait to go back-to-school shopping. Why? Because we always went to JCPenny and I could stand in the leather belt rack smelling that smell of horses. I still have a photo of me around 11 yr old on my fridge riding with a friend on her 16h QH, "Beauty". We are both easily squeezed into a western saddle (me in the front) in sneakers, no helmet, and no concerned adults to monitor us. We rode that guy, sometimes soft and sometimes hard, with no fear at that age. Those are wonderful memories for me, but I still couldn't buy my first horse until I was 32 yrs old. The timing in my life was right at that point. No, the passion never died from my childhood....it was inevitable for me to become a horse owner. My life is better, happier, and more fulfilling because of Sam, Breezie and all our friends at the barn (yes, you included Sidetracked!). First, GREAT pic up there. My Dad always says that I have loved horses "since she had legs". Well, thats sure what it seems like. I too begged rides, begged lessons, worked in exchange for lessons..... and was, and still am obsessed with horses. I am old-ish now, and still see horses in my dreams. My Appy died at the ripe old age of 40 not too long ago, and I am just now thinking about getting another horse. 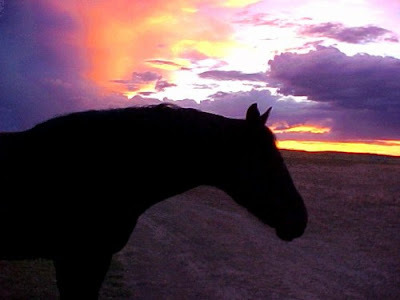 I have had a few rehab horses in of late, but... its not the same... there is something "missing". I swear, it's something we're BORN with. It's either a part of you or it isn't. My parents so did not get it or me. When I got my first horse at age 55, I mused to my mother that I knew exactly how my dad (RIP) would have reacted -- very critically -- and she reluctantly agreed. But it truly was the dream that wouldn't die regardless of how unrealistic it seemed for all those years. Great post, Sidetracked... I was trying to remember how I got into horses - I just remember always being obsessed with them. I had horse everything - books, toys, games, puzzles...etc. I even had breed books that I would read and memorize. 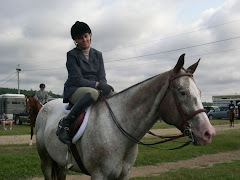 I started riding with a friend's mom - they had an ancient shetland pony that they let me ride. I helped them out at shows and stuff. We had a 50 acre farm growing up, so I begged, whined, pleaded - and proably cried - and when I was 12, my parents bought my first horse. I was beyond thrilled.